2x3.5 Custom business card magnets 20 Mil square corners will allow you to make people believe that you are here to stay. These personalized magnetic business cards are crafted over 20 Mil magnets and they will stand out with full color imprint over them. It doesn’t matter whether you are going to networking event or non-networking events, keep yourselves loaded with these personalized business card magnets. Our prices include full color printing, shipping, artwork assistance and unlimited digital proofs. Order today to receive low price guarantee for these personalized magnets! 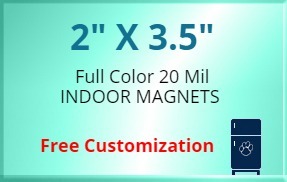 Request a quote to know discounts that you can avail on bulk ordering these 2x3.5 personalized business card magnets 20 Mil square corners.